It was a long journey from London to the Asian city that describes itself as a little red dot. Two sets of little red eyes arrived in Singapore desperate for a cool room and a comfortable bed. We checked in to the Marina Mandarin hotel for our 3 night stay. The hotel had a very good location in the city and we particularly liked being able to walk straight into the adjacent shopping malls. The Hyperfresh supermarket was useful to stock up on snacks and things for in room DIY breakfasts. Cocktails at the bar Smoke and Mirrors atop the National Art Gallery. Makansutra Gluttons Bay was our choice for dinner. It was clean, hugely popular and had stacks of choice. 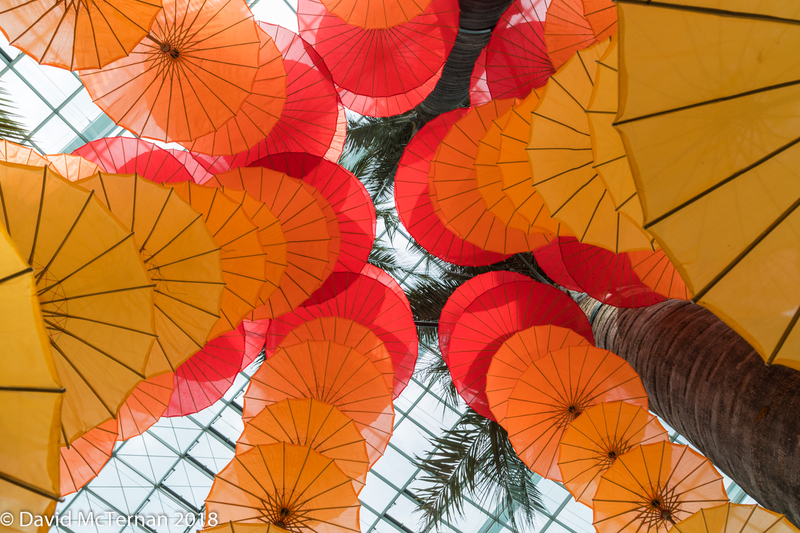 A good introduction to Singapore hawker food. Lovely to sit at tables outside on a balmy night when there was snow back in the UK. 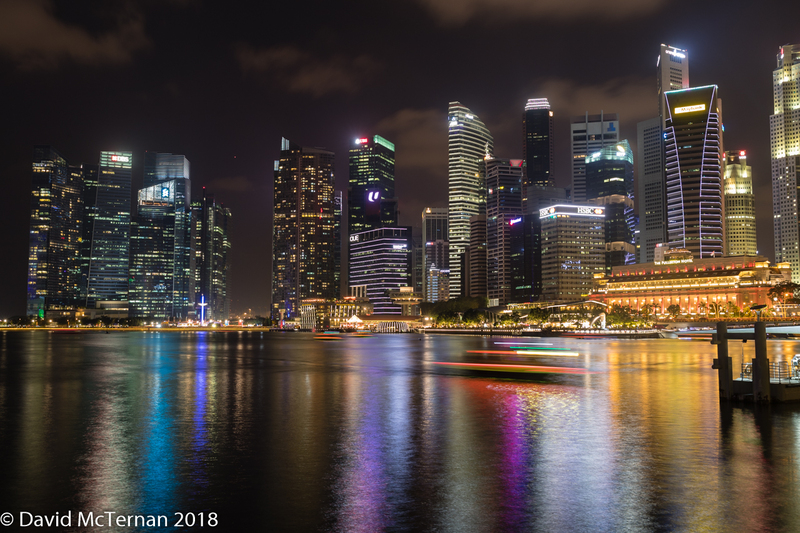 We watched the nightly bay light show while befuddled with exhaustion and realised rather too late that the best spot for viewing was the plazza outside Marina Bay Shoppes, not Marina Bay Square. 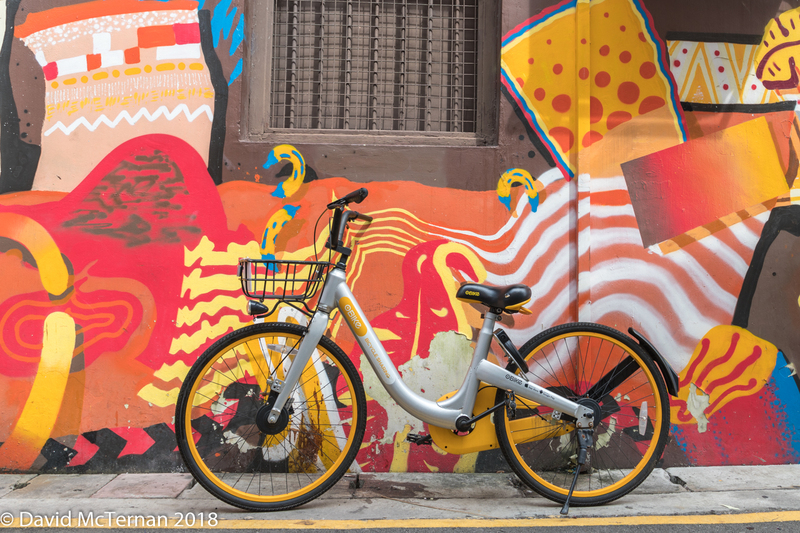 An excellent city bike tour with Let’s Go Bike Singapore. 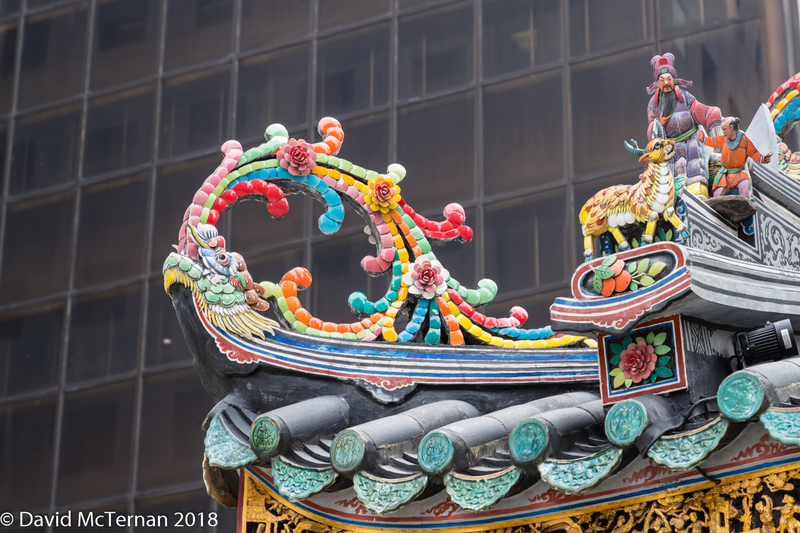 We visited Chinatown and walked to the top of the bijoux Temple of the Buddha’s Tooth. 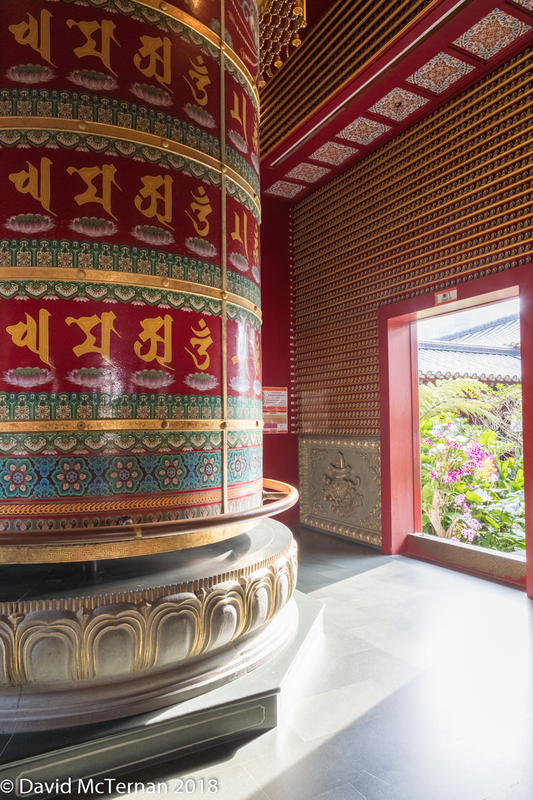 Based on what we have seen in various locations in Asia, the Buddha must have donated both his milk and adult teeth to the collections of assorted temples. 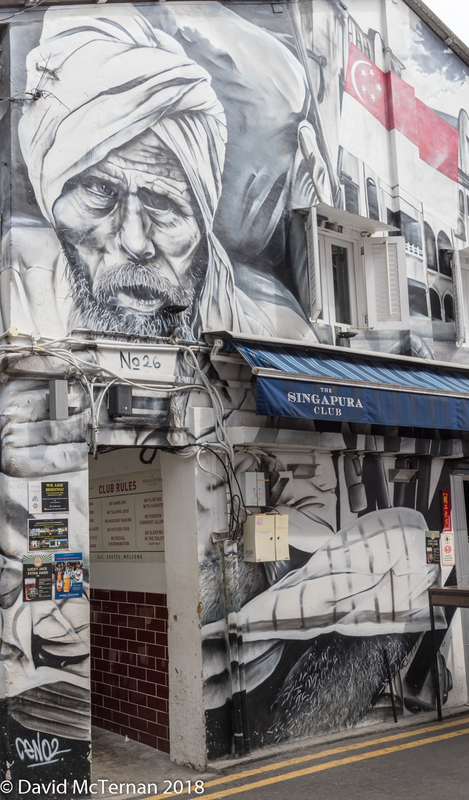 We explored the hipster shops in Haji Lane and got a taste of old and new Singapore. Very clean, green and modern. Even the beggars are regulated and have to sell tissues in designated places rather than just beg. City business people mingled with temple goers. The tour was a great overview and included a stop for drinks and snacks in a locals’ food court. Our guide, Alfie, told us that his grandmother warned him never to shelter under a frangipani tree as that is where ghosts live and they might come and get you. Always interesting to hear about how children get emotionally scarred in different countries. 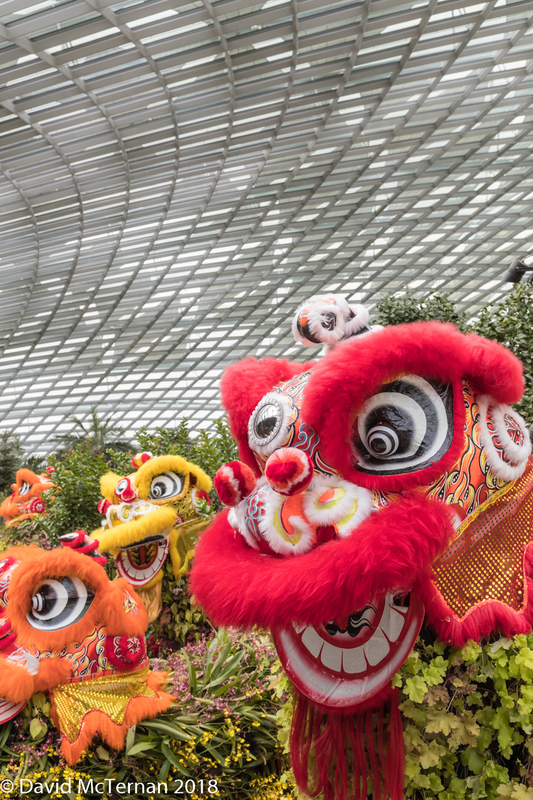 We spent the afternoon in the unmissable Gardens by the Bay. 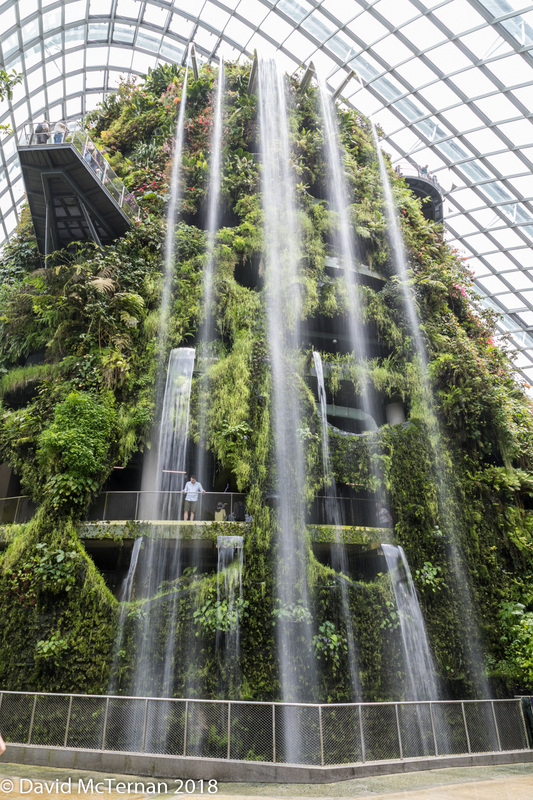 Both the Cloud Forest and the Flower Dome were pleasantly cool and interesting to walk around. We learnt from the Uber driver that the ERP (road toll system) is known as Earnings Robbery Programme and is due to be extended to track every car on Singapore’s roads with GPS. All the signs of a police state with cameras everywhere – every building, lift, shop, road junction, public area etc etc. Our bike tour guide said you may not see many police but as soon as something happens they are everywhere. Walked back through the impressive Supertree Grove. Cocktails at Atlas bar in the Parkview Square building which looked like Gotham City from Batman. The bar was very impressive in a heavy brass Teutonic way. 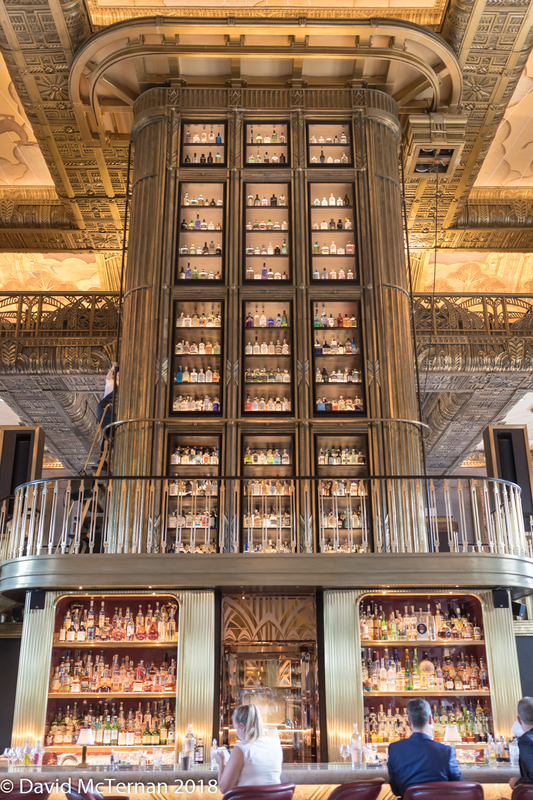 It claims to have the worlds’ largest gin collection which ran from floor to lofty ceiling. They have a dress code – no open shoes, shirt and trousers, smart dress. Dinner in Coriander Leaf in Chjimes. The National Museum of Singapore was a good place to spend a morning in air conditioned modern comfort. 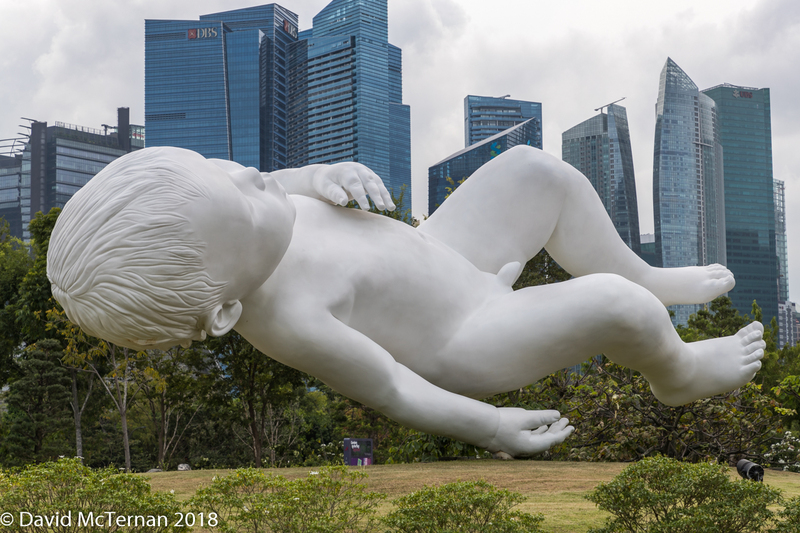 It showcases Singapore history and art with clever use of modern technology and is as good and probably better than any museum we have been to in Europe or America or Australia. Still, there is something a tiny bit aren’t we clever? Look at us! smug about Singapore. Some have described it as sterile. It is certainly different. One of the most interesting areas of the museum is life under the Japanese occupation and the war in general. They have suffered so we cannot be too harsh on their delight in their modern achievements. Lunch at Wild Rocket @Mount Emily. Back to the Gardens by the Bay to see the parts we missed and get a good spot for the nightly Garden Rhapsody Sound and Light show. 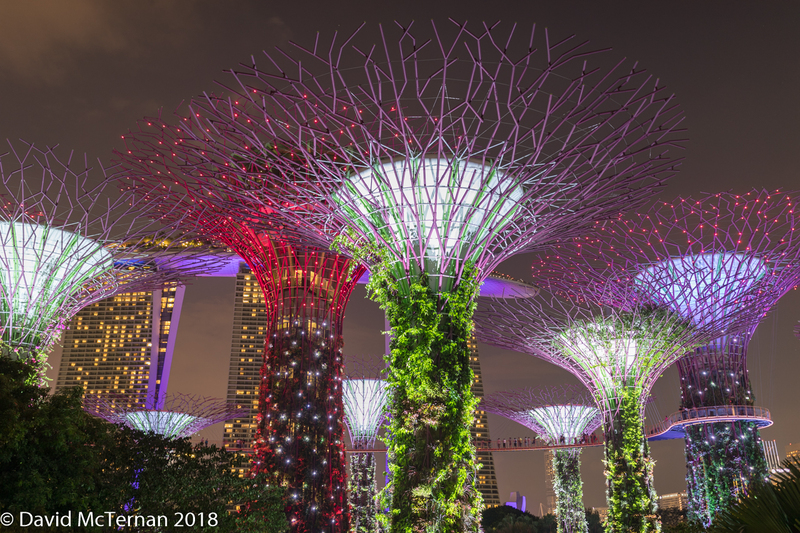 The Supertrees reminded me of something from Dr Seuss. Somewhere a Lorax might live. We followed the evening crowds to the Marina Bay Sands hotel which was a chaotic mass of people. So glad we didn’t stay here. 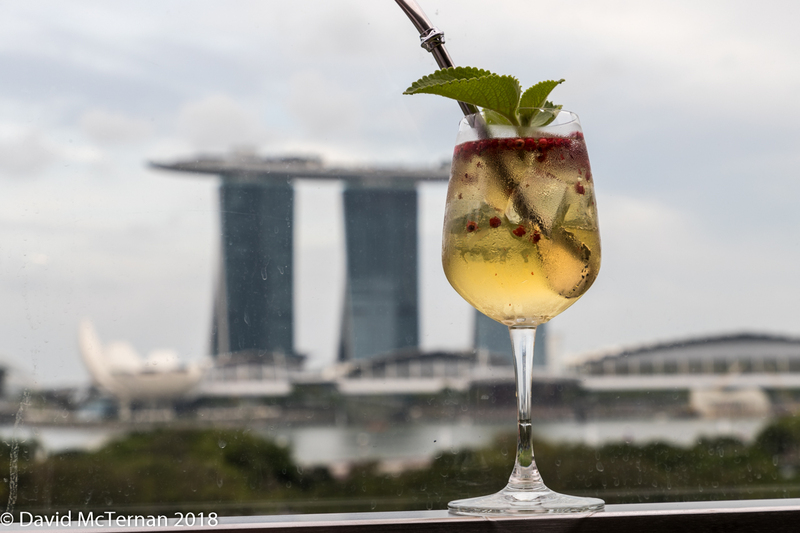 We paid a SGD20 each fee to access the 57th floor in tower 3 for the C’est La Vie bar and enjoyed the view and experience a little more than the drinks. 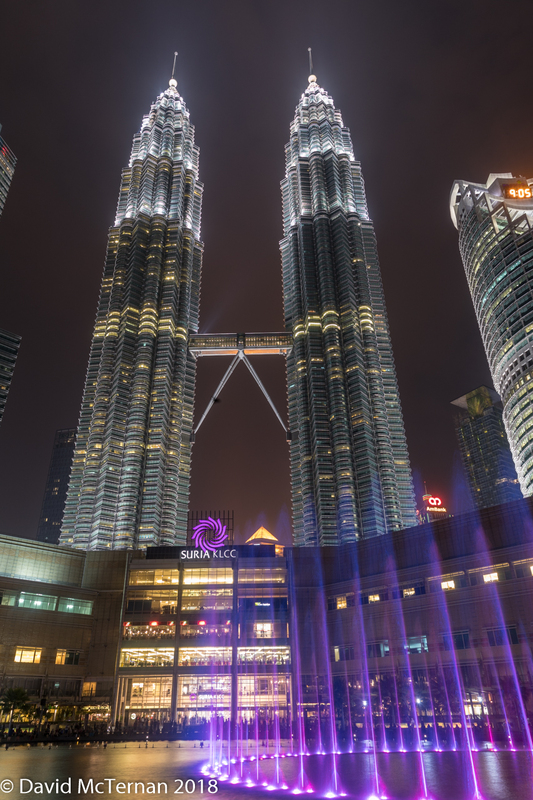 We checked out of Singapore and flew to Kuala Lumpur. How do Malaysia Airlines get away with endlessly supplying passengers with in-flight peanuts ? Why do they not kill people? First impression was that it was more humid and sort of grey compared to Singapore. It is a city which used to be dedicated to tin mining at a junction of rivers but is now much more like high rise buildings and fly-overs. 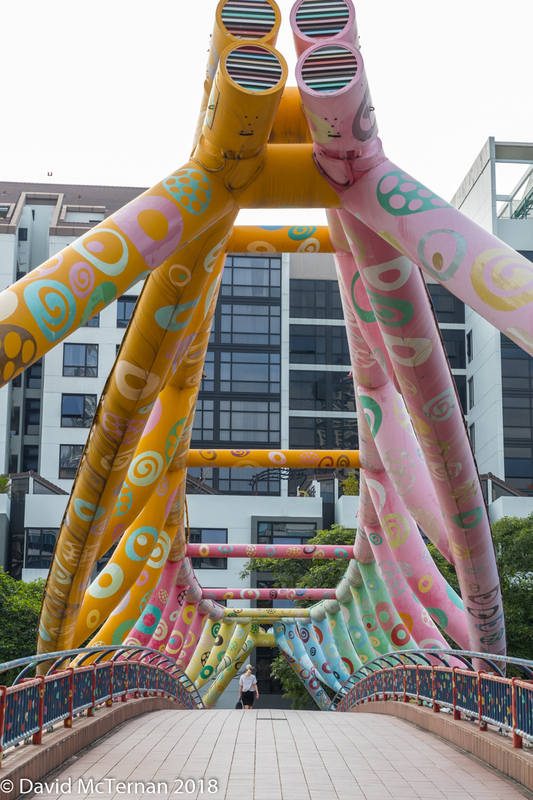 But like many places, it reveals its charms as you explore. Viewed from a tall building like our room at the Sheraton, you can see that there are loads of green spaces. Plus it is cheaper than Singapore. And the food is amazing. People are helpful and we soon learnt a few transport lessons. Uber might exist but is pointless in rush hours which in a lot of KL is pretty much all day. Rain storms compound this problem x10 and we sat for 1 hour in the car of a very pleasant architect when we could have travelled 10 minutes by monorail. The monorail, MRT, was right beside the Sheraton and once we were well supplied with small notes getting our 45 pence tokens was a breeze and all the big malls we wanted were a mere 3 stops away. It was easy to get a local SIM too and we did this in one of the minor local shopping malls. We ate in the mall Lot 10 in Tonkatsu Anzu. Dinner for two for £18 total. We went to the Theun Ho Buddist Temple. Given the delays yesterday we decided to try Grab instead of Uber which is more popular in Malaysia. However, the app failed and we took a taxi hailed by the hotel instead. Not very expensive at around £6. The temple is built over 5 floors and has good views of the city. 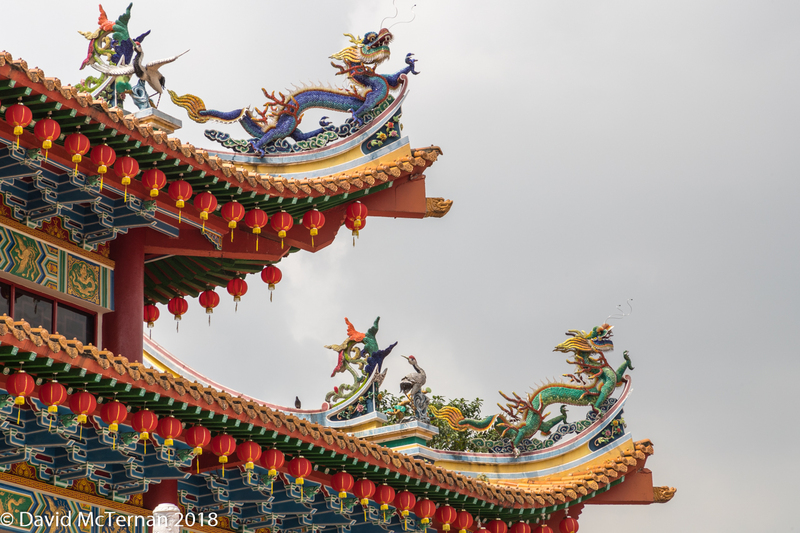 It is pretty in a garish temple way with interesting dragon carvings. Lots of wedding photos seemed to be taking place. We stopped at the Pavilion KL mall for lunch at Tokyo Street which was again fabulous value before heading back to the hotel on the mono-rail. Fast, reliable and right next door to our hotel. In the afternoon we’d booked a couples’ spa massage of 2hrs duration. Very relaxing and I almost dropped off but the thunder and torrential rain lashing the windows kept me awake. Truly biblical rain. We noticed the vast rain ditches by the roads had gone from empty to nearly full once we ventured out in the evening. 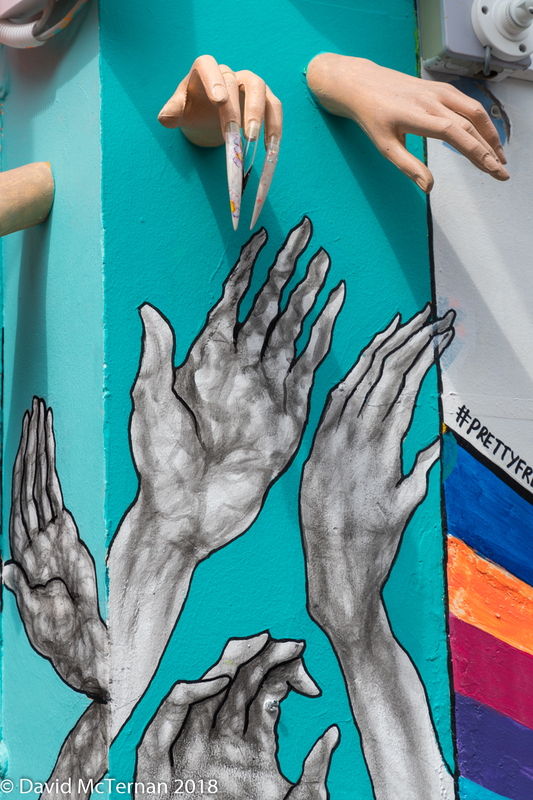 We walked down Jalan Alor which is a street packed with hawker stalls selling pretty much anything you wanted from durian kebabs to frog porridge. Dinner at Opium KL. Reminded us of similar tourist traps in Siem Reap. 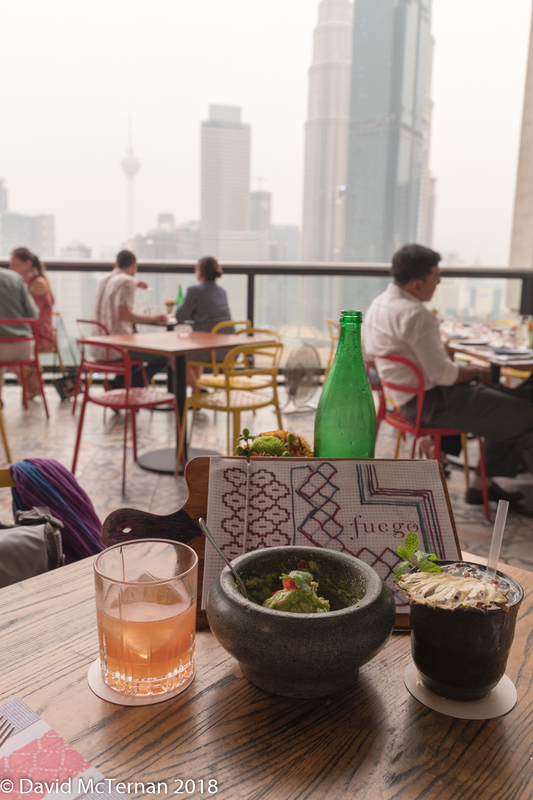 Westerner-friendly, fusion cocktails and had old Bruce Lee films playing while you ate. 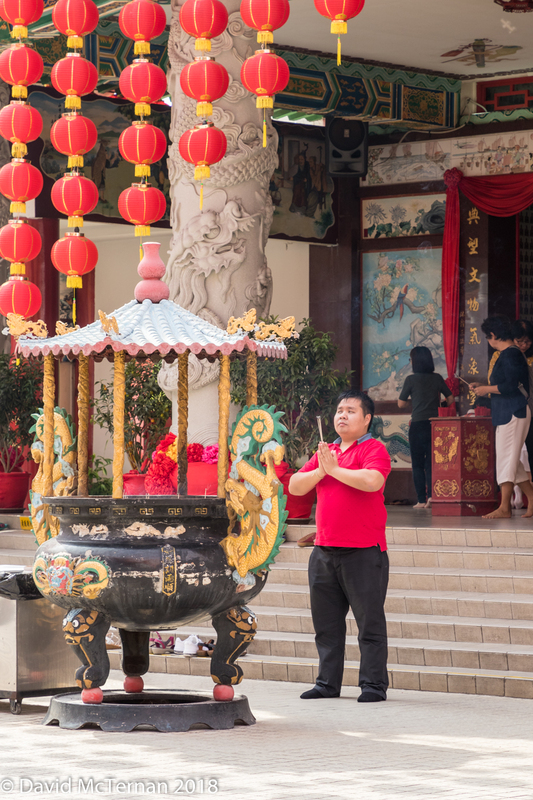 Walking around KL is like sticking your head into a bamboo basket of dim sum. The air is herby and sort of sweet and steamy. We had never heard of a Chinese Valentine’s Day where young women write their mobile phone numbers on mandarin oranges and toss them in lakes or rivers. But here it was. 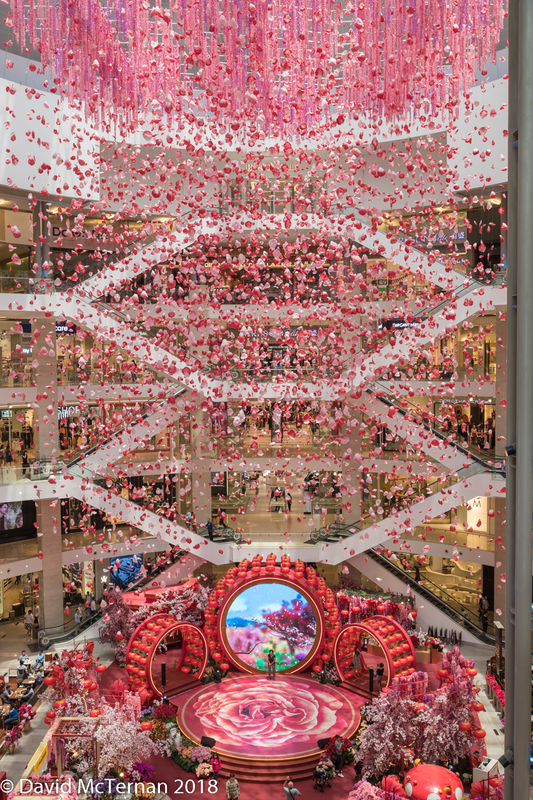 We did a crawl of the major malls and came across a Mr and Mrs Competition and lion dances to celebrate the end of the Chinese New Year. All in the comfort of the air-conditioned shopping centres so a good way to escape the heat of the day. 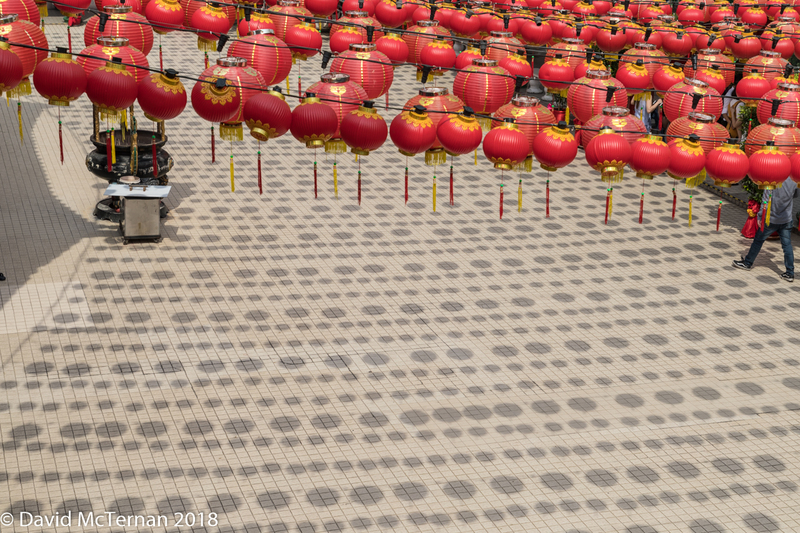 Also interesting to see how KL is such a multicultural blend with staff in hijabs happy to dance on the stage in traditional Chinese women’s costumes. Chinese New Year, Eid and Christmas. Everyone loves a family get together, food and a party. Dinner was an interesting fusion mix in Fuego with the piece de resistance being a huge Australian prime rib of around 1kg. Also, a great view of the Petronas towers and cityscape. 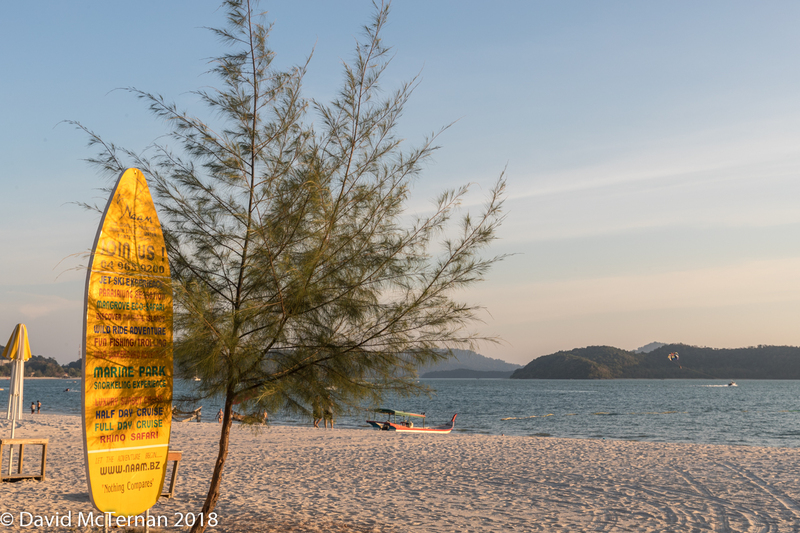 A short flight to the island of Langkawi. 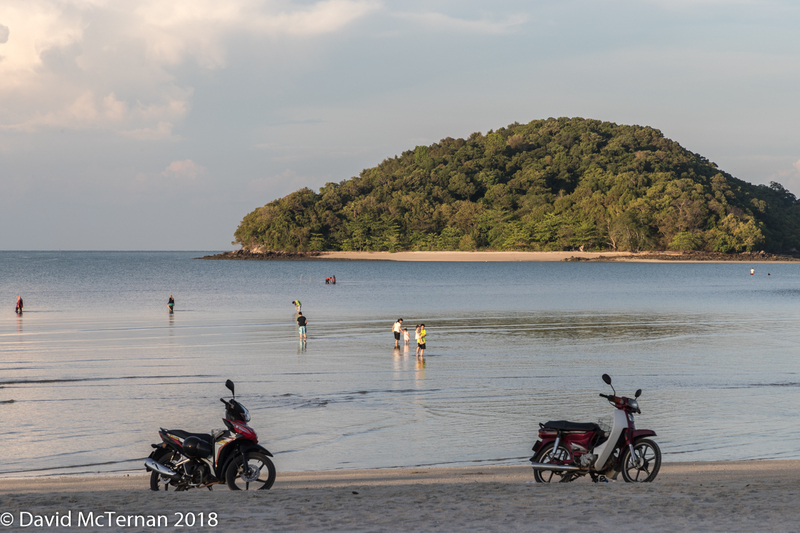 This was a place I had heard Malaysian friends speak of and it had that exotic island appeal. It was certainly a contrast from KL. More rural, a drier heat. Less modern and more rubbish around on the roadsides. Reminded us more of a Caribbean island than anywhere in Asia. The hotel arranged via the Secret Escapes package was Meritus Pelangi Beach Resort. First day was spent exploring the gardens and the beach. We were given a free first night dinner in the hotel’s beach-front CBA restaurant but we found it rather disappointing. We were glad we had a room only deal. We had breakfast at the neighbouring boutique hotel, La Casa del Mar and found the food and service much more to our liking. A pleasant walk along the beach from our room. We saw people a long way out to sea up to their ankles in the water. There seems to be a sand bar that stretches most of the way to the opposite island. We asked a local who said they were searching for mussels and that it was safe for a short period. 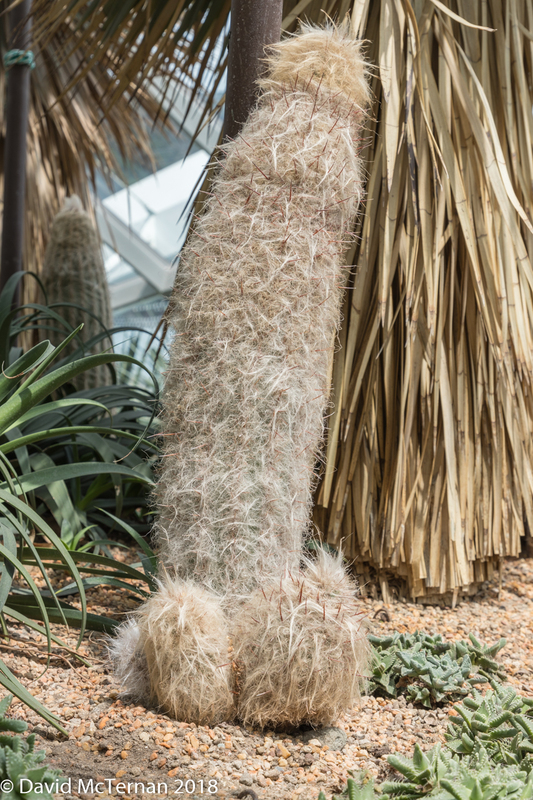 Reminded me of the tragic cockle pickers in the North of England. 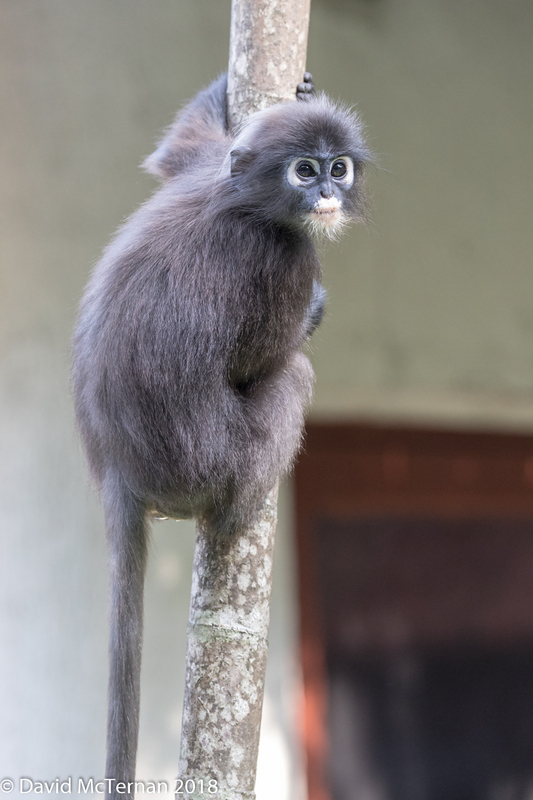 On the way back we saw two Spectacled Langur monkeys in the trees outside our room. It seems they are keen on young tamarind fruit. Their eyes are very unusual. I tried a few pictures but they stayed hidden in the canopy. Evening dinner in Casa del Mar at a table directly on the beach. This morning we took the Mangrove Kayak trip with Dev’s Adventure Tours. It was a little misleading as it is not all kayaking. First, a lengthy transfer to the interior east side of the island. Then a little motorboat trip to a cave. It had rows of well-behaved small bats. Just a little bigger than those in the UK and none flying around or being a nuisance. 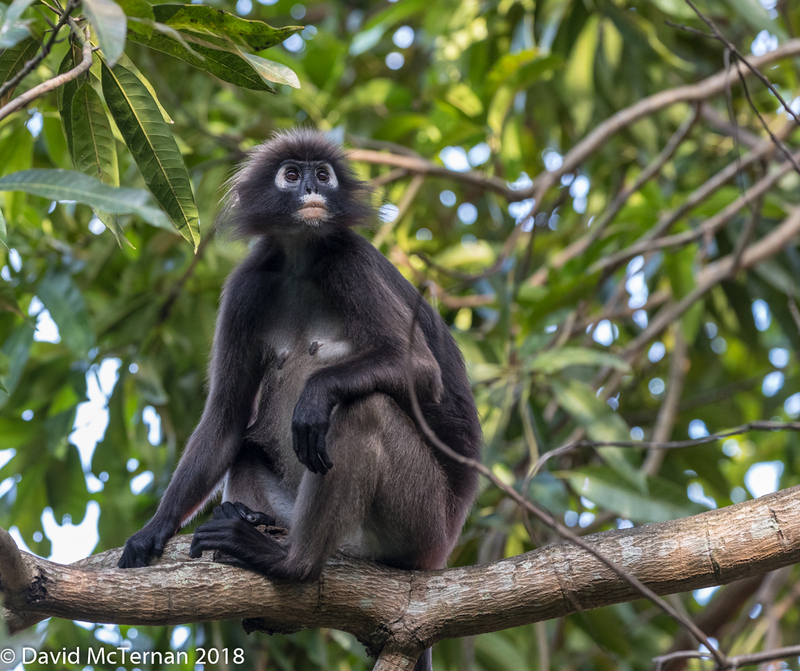 A troop of macaque monkeys came in to listen the the guide and we were warned to be more scared of them than the bats as they can cause nasty bites. 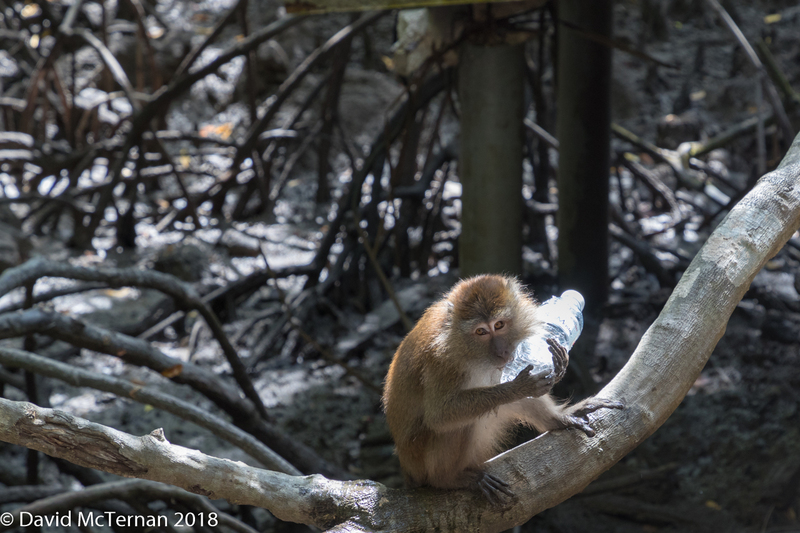 The guide knew of a tourist who had sustained a serious spinal cord injury due to a bite from a monkey he annoyed. 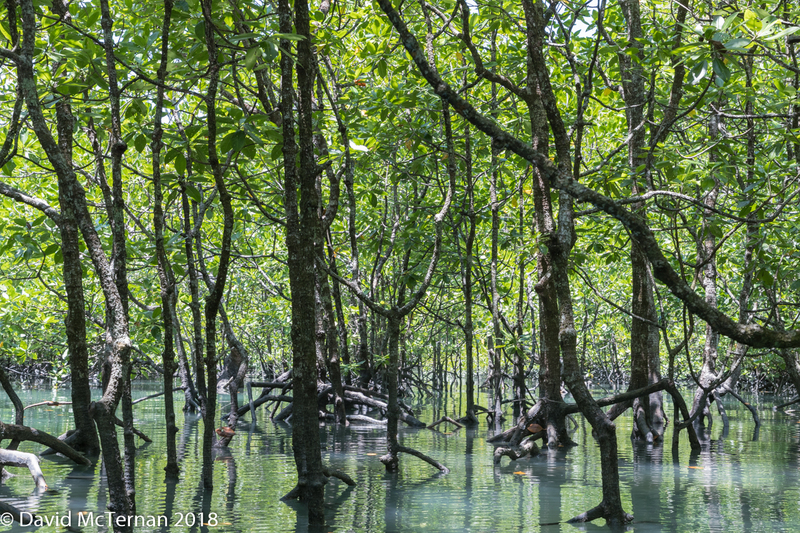 We were given our kayaks and paddled for about 4.5km through the mangrove forests learning about how they saved Langkawi from the tsunami and the many uses they used to have. Vipers and other equally unpleasant snakes also live amongst the trees and at certain and we were warned not to knock into them with our oars. Dinner was at the Unkaizen Japanese to the south of the beach area. Very authentic Japanese food with great service. We thought we may as well do the cablecar ride and have a look around the Oriental Village complex which is where the cruise passengers go. Again, similar to a Caribbean equivalent but a little more shabby. We shared a cable car cabin with two chatty members of staff who were knowledgeable about European politics. The first section has the steepest incline at 42 degrees and it feels like you are climbing the rock face vertically. 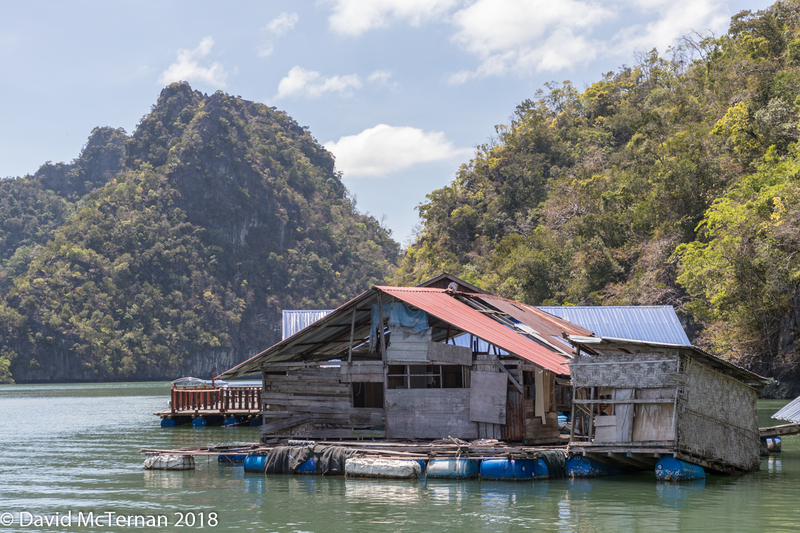 There is a viewing platform from where you can see some of the 99 islands composing Langkawi (at high tide – there are more at low tide). It was a bit hazy so less dramatic than it might have been. 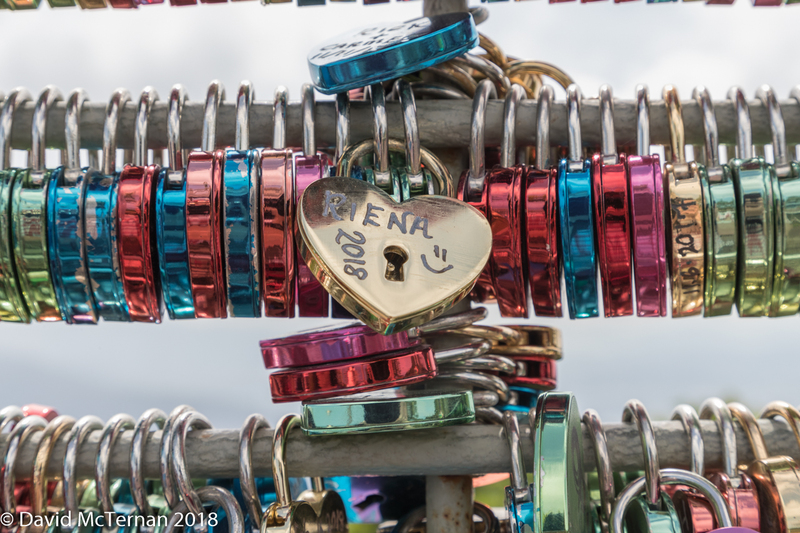 Then on up to the second station which is around 660m and has two viewing platforms connected by a bridge which is growing a selection of the love padlocks in the manner of a Parisian bridge. 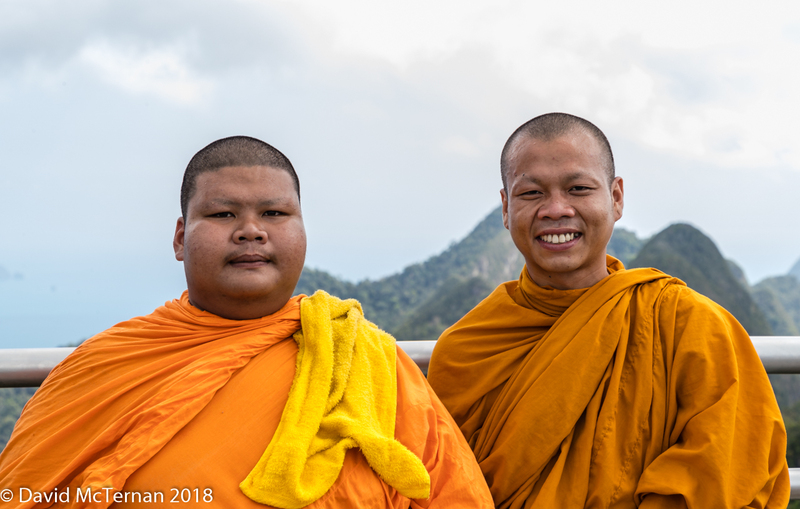 We came across a party of monks from Thailand dressed in bright orange robes. They were less shy than their brothers in Bangkok or Cambodia and we took photos for them. In return they wanted a selfie with me. Lots of smiles and handshakes all around. The 3D Art in Paradise was an amusing distraction with various scenes you could place yourself in. 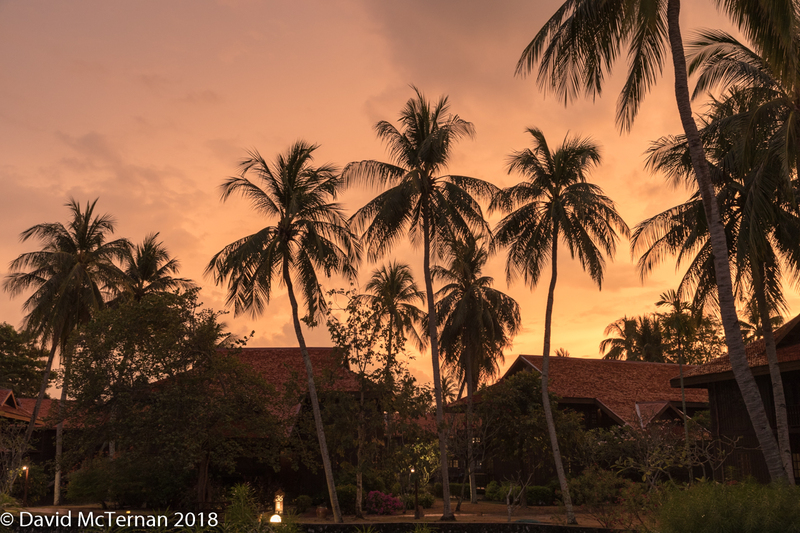 We booked dinner at the Berjaya Resort (Pahn-Thai Restaurant) which is in the UNESCO geopark and has paths through the jungle and many wild animals. There’s a story of a monkey who knocks on people’s doors then races through their legs to get in the room and steal food or minibar drinks. Sounds like a Langkawi urban myth. We did see lots of fearless birds and monkeys almost as soon as we arrived at Berjaya. The lady at reception said that 15 minutes before the macaque troop had been helping themselves at the Starbucks café. We had arranged a Nature cycling trip via Dev’s Adventures again. 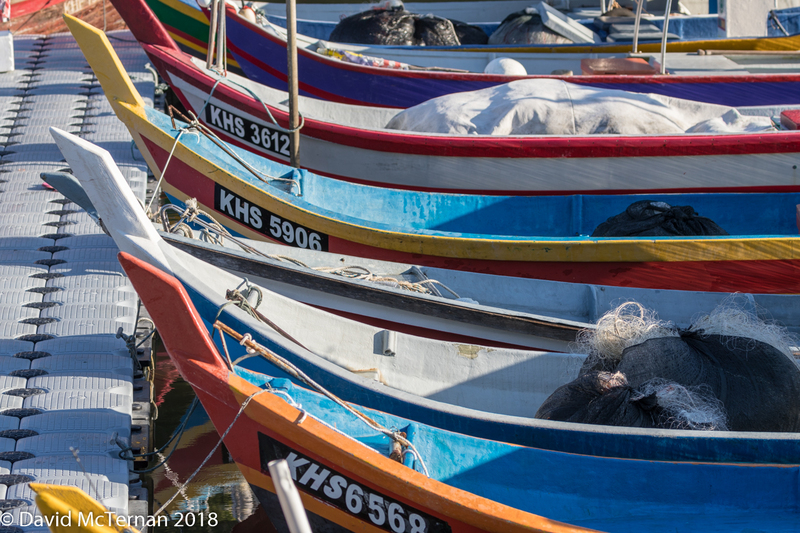 This was an interesting tour with guide Yann and it was centred on local life on the island. 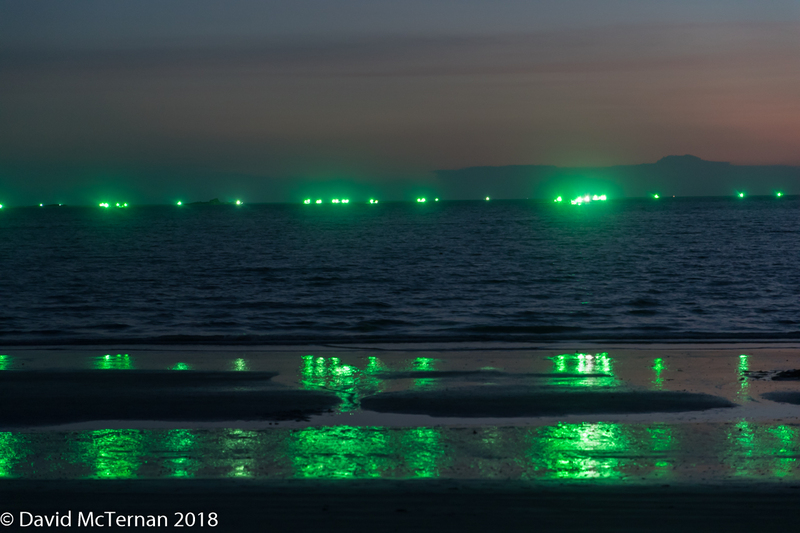 Opposite our hotel we had seen a long line of green lights out on the sea. 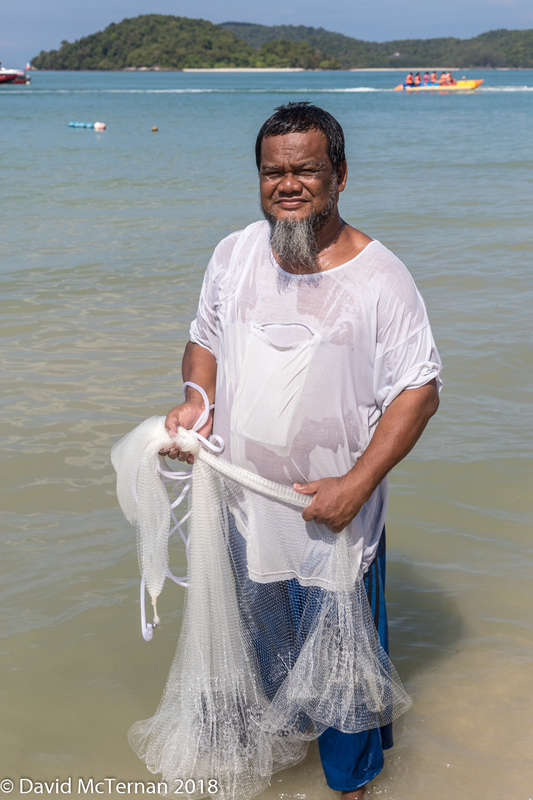 Yann explained that nearly every local household had a small boat for night squid fishing as the catch was worth RM20 per kg. 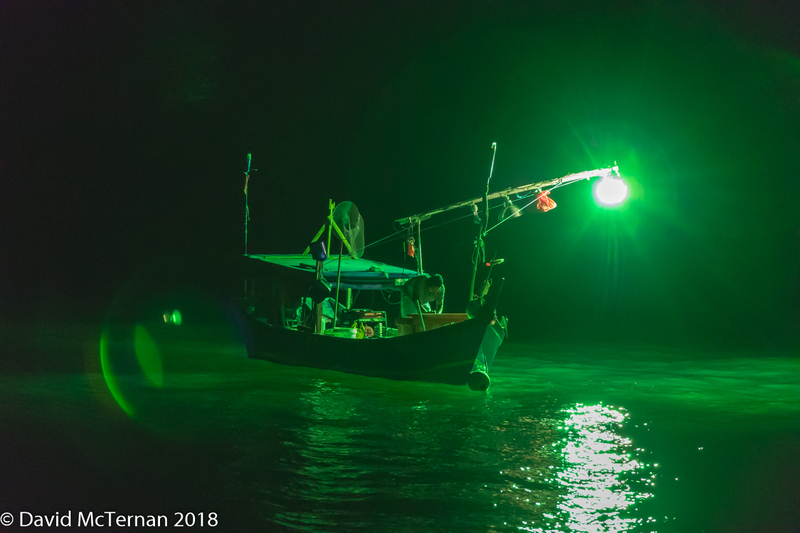 The squid got scooped up when they were attracted to the green lights of the boats. We also visited a local market, a café where we had freshly made roti cani and we called in with some friendly locals known to our guide. 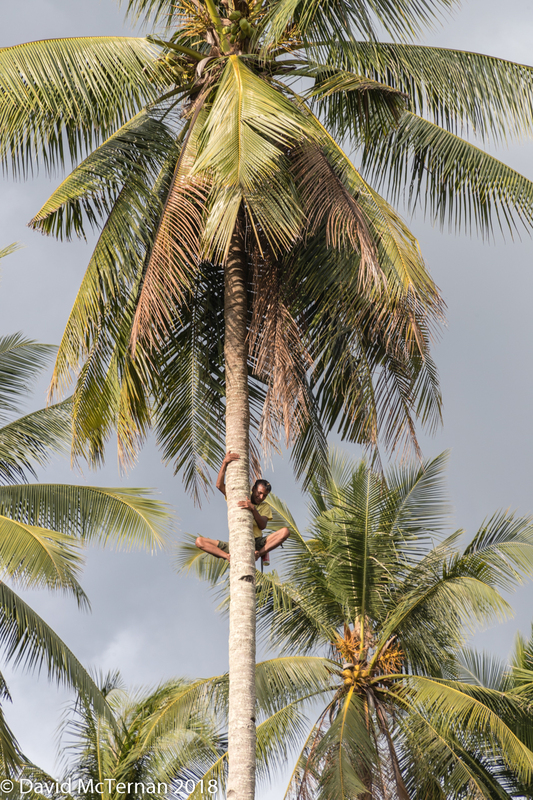 We also saw a person cutting down coconuts about 30m in the air with no harness etc then shimmy down the tree with no equipment besides his bare feet. We also met a local who had built his own multi-story house from various shapes of logs. He was very proud of it and is now on the cycle tour itinerary! As we reached our furthest point, a few drops of rain started with dark clouds on the horizon. 5 minutes later the deluge started. It was so heavy we couldn’t really see and I had to hold a hand over my eyes pressed to my forehead to see where I was going. Then the thunder and lightening started. We were soaked though in minutes but much cooler. It might have been easier to swim back at some points as the paths became covered in water and reasonably deep in places. Over all we rode 22km and saw a slice of the local life and experienced nature in the raw. Definitely recommended. Luckily the Malaysian money is plastic because it was soaked completely but was dry after a few minutes with the hair dryer. I can’t say the same about the rest of our clothes. The storm resulted in a gorgeous golden light at dusk. It brought out the bats in the resort for the cooler evening. Our trip today was the Dev’s Adventure Jungle trek & Evening walk. This brought us back to the Berjaya resort. Guide Jerome was very knowledgeable about the fauna and flora. 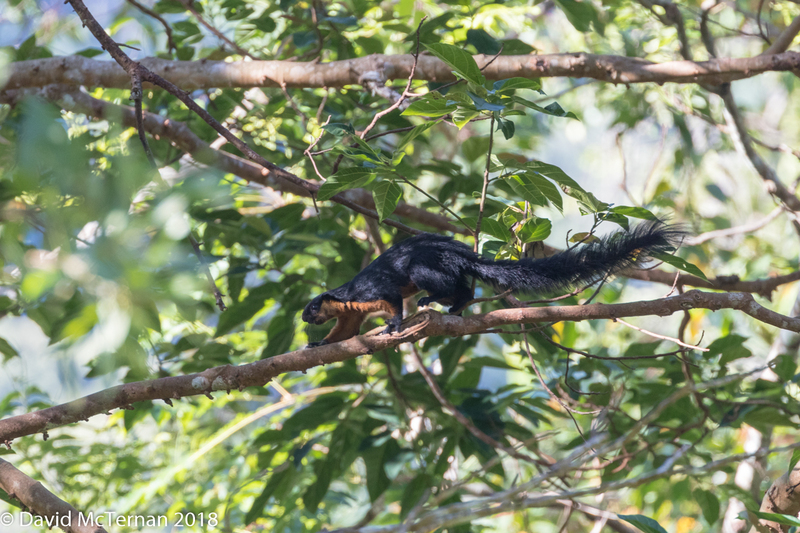 He pointed out the sleeping flying lemurs and squirrels in the trees – we had completely missed these the previous day when we had come for dinner. They sleep with their eyes open. A couple had babies. We saw the usual selection of monkeys and birds in the grounds as we walked the length of the hotel. At the end we applied mosquito repellent and put on our long trousers for a 1.5hr trek through the rain forest at the edge of the sea. We saw various trees: sandalwood (and how people sneaked into the forest to cut it down for the essential oils), iron bark tree (axes don’t impact it); mahogany and so on. We saw termite hills which often come with a resident viper and they have a symbiotic relationship. The walking was gentle but it was very humid and dark when we finished the descent. 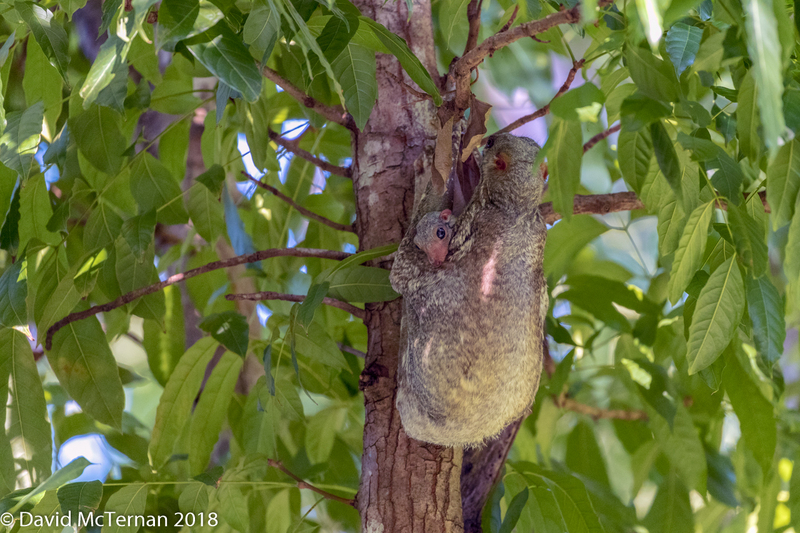 On the way back through the resort we saw the flying lemurs waking up and we saw two gliding through the air like furry square tea towels. 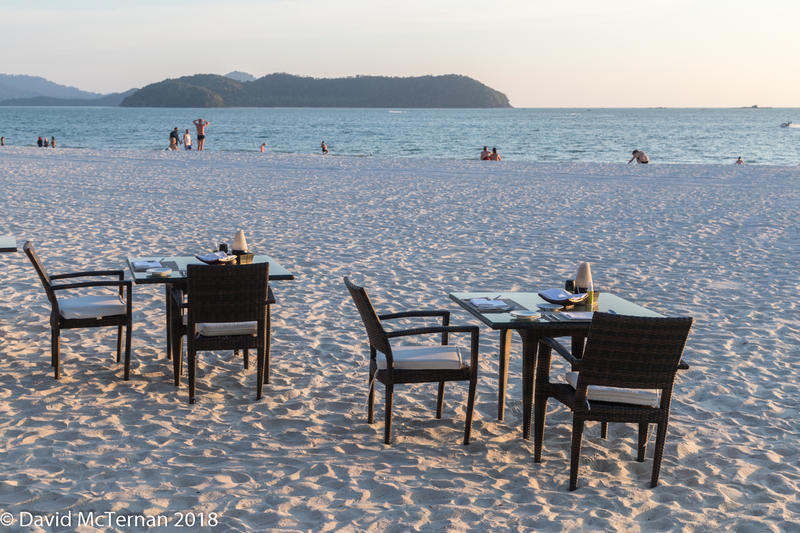 Dinner on the beach at Casa del Mar – we ended up as the only table on the beach as the others got cleared. An early start for the birdwatching walk with JungleWalla. We had given them a target list of birds. This was a very comfortable tour round the island in an air-conditioned bus with various forays out to see: Wreathed hornbill, chestnut headed bee-eaters, oriental pied hornbills, collared and white throated kingfishers, red-eyed bulbul, lesser coucal, dollarbird, spotted dove, ashy and lesser racket tailed drongos, white bellied sea eagle, cattle egret, brahminy kites, read wattled lapwing, scally-breasted and white headed munia, common myna (all over the place), common sandpiper, brown shrike, Japanese sparrow hawk, crimson sunbird, grey wagtail, white breasted waterhen, and a beautiful black-naped oriole. Not too bad for a 4hr tour. Sadly I didn’t get that many pictures as they were some considerable distance away. 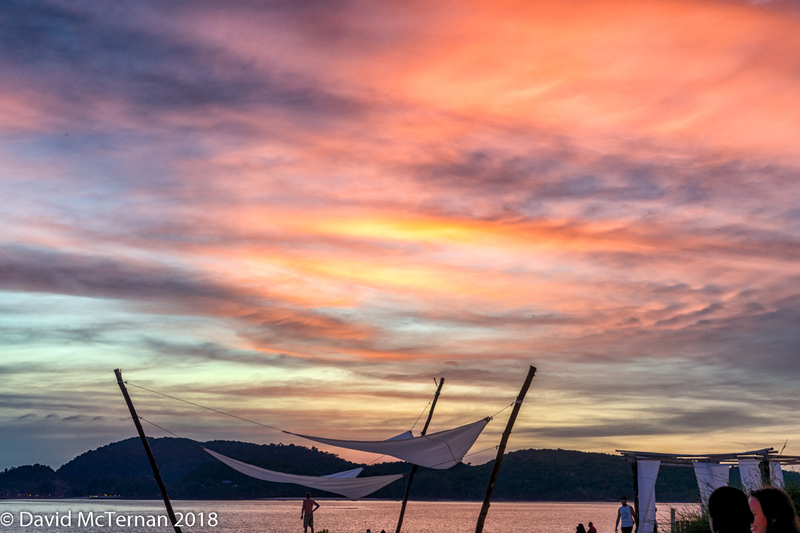 The rest of the day was for chilling, swimming, gin on the beach at sunset and our last evening meal at the usual haunt. We spent our last day on the beach, in the spa at Casa Del Mar and gathering our strength for the very long journey home via KL. The day was 45hrs long. Use pre-booking on Uber in KL. Use monorail or MRT in the rush hours or rain. Faster and cheaper but crowded. Monorail machines only take 1 and 5 RM. Singapore deserves around 4-5 nights rather than the 3 we allowed.